Flux's innovative dynamics processor adapts to your programme material in a much more sophisticated way than conventional compressors. But how does it sound? The latest plug‑in from Flux Sound & Picture Development is difficult to compartmentalise, other than to describe it as a dynamics processor designed mainly for mastering applications. Flux have resisted the temptation to produce yet another compressor; instead, they've tried to take a fresh look and come up with something different. 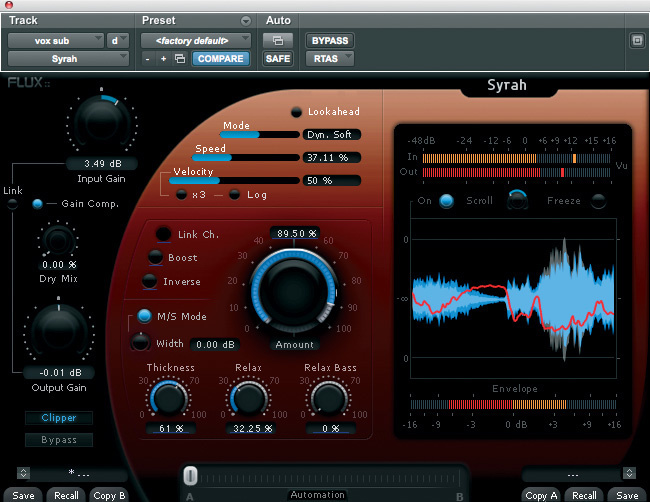 Syrah is available in all the usual native plug‑in formats, and is authorised by iLok or proprietary Flux dongle. As soon as you open this plug‑in, it's obvious that it is different to any conventional dynamics processor. There are hardly any of the controls you would normally expect to find, such as ratio, threshold, attack or release. Flux explain that "the controls are not the usual suspects found on a dynamics processor. Instead, the controls provided typically affect more than one parameter in the underlying algorithms, with everything carefully tweaked, allowing for creative processing”. A Mode slider switches between three algorithms: Static is more akin to conventional dynamics processing, while the Dynamic Soft and Deep modes make many of the parameters programme‑dependent. As well as compression, the processing incorporates elements of 'de‑expansion' (of which more in a moment) and level‑independent transient shaping. In place of normal time constants, there are Speed and Velocity sliders, while the degree of processing applied is controlled using a large dial, labelled simply 'Amount' and calibrated as a percentage. The character of that processing is further shaped via three dials labelled Thickness, Relax and Relax Bass. Other features include M/S as well as conventional stereo processing, the ability to blend the dry signal into the output for parallel compression, and an optional automatic gain‑compensation algorithm to enable more accurate A/B'ing of dry and processed output. In place of a standard gain‑reduction meter, there's a scrolling waveform display, over which a red line shows the composite effect of any dynamics processing applied. The Relax control seems to introduce progressively more programme dependence into the compression ratios and release times, for less obviously processed results. Relax Bass reduces the influence of low‑frequency signals over the dynamic processing, rather as high‑pass filtering the side‑chain signal does in a conventional compressor. The manual explains that Thickness, meanwhile, "fattens up the processed material by enhancing the low‑level frequencies when possible. The processing action will then go from de‑expansion to compression (instead of compression only).” Unfortunately, it doesn't explain what 'de‑expansion' is, and how it differs from compression. Expansion is about increasing dynamic range, usually at low levels, so presumably by 'de‑expansion' Flux mean reducing the dynamic range of low‑level sounds to bring their apparent volume up, rather than reducing the volume of high‑level sounds, as conventional compression does. It's a shame the manual doesn't explain this. As well as the main dynamics processor, Syrah also features something called a Clipper — which is an unfortunate name, as, in my book, clipping refers to the truncation of a waveform, with ensuing ugly distortion. But what Flux mean in Syrah is a peak limiter, with parameters that follow other controls in the plug‑in. As with Flux's earlier Solera, the input and output are referenced to ‑16dBFS, which seems odd to me. It a digital world, and what we are interested in is how close we are to 0dBFS. To have to constantly do the maths is a pain, and after a while I ignored the numbers and just used my eyes. Because there are so few conventional controls, it took me a while to get to grips with this plug‑in. I chose to go to my backup drives and pull up the Session that I used for my shoot-out of Pro Tools limiter plug‑ins back in May (/sos/may06/articles/ptworkshop_0506.htm) and August (/sos/aug06/articles/ptworkshop_0806.htm) 2006, to see how Syrah would perform on the same material. The first sample I tried was my drum & bass track, and it showed how well Flux have designed this plug‑in. The Relax Bass control worked really well, allowing the kick and bass to come through really solidly as the overall loudness was increased, without suffering pumping side‑effects — no mean feat for a single‑band processor. This sample also benefited from the M/S mode, in which the material is first M/S encoded, before the 'M' and 'S' paths are individually processed and then matrixed back to stereo again just before the Dry Mix stage. This is a well-known technique that is often used in mastering, and can widen or narrow the stereo image, and enhance or reduce the impact of instruments panned centre, such as kick and snare drums. On this sample, simply going into M/S mode without increasing the width at all improved and opened out the image: although the sound was being compressed, the image apparently wasn't, which was very impressive. My rock opera sample is always a challenging one, with many layers to the mix. For this sample I chose the 'Dyn Soft' mode, and I found that small amounts of Thickness helped to increase the density of the sound. Once I had tweaked the settings, Syrah produced the best vocal cut I have heard on this sample. I really started to understand the scrolling display when I tried my jazz quartet sample. I could start to see what was going on, and which sections of Syrah were having what effect. However, I found the default scroll speed too fast, and had to slow it down quite a bit before I felt I could take in everything that was happening. The manual was not a great help in understanding this section, either, as the image used to identify each section of the plug‑in window is in black and white and the text description doesn't identify what colour things are, so I was left to work it out by trial and error! It turns out that the light-blue waveform represents a mono sum of the input signal and the darker blue one the output, while a light-grey waveform shows what the Clipper section is doing. The red bar-graph going to the left displays compression, while the orange bar-graph to the right displays the amount of de‑expansion. Back to the jazz quartet sample, the sound I was able to get with Syrah was very impressive. I used quite a lot of Relax Bass to allow the kick and bass to come through nicely, and I was still able to increase the overall volume without any nasty side‑effects. I did need to be a little careful with how much Amount I used on this and the Rock Opera sample. Too much and it started to sound very squashed, but a setting of around 70 percent worked very well. Moving on to my classical sample, I was able to introduce some Thickness to bolster the low end without it sounding boomy, and even in this sample, I still used quite a bit of Relax Bass. Yet again, the degree of loudness improvement without nasty side‑effects was very impressive. Again, with this sample, the waveform and the red light that "displays the final gain envelope (linear)” were really helpful. It is a neat touch to superimpose the gain envelope on top of the audio waveform, so that you can see how Syrah is modifying the dynamic range all in one display. Finally, my vocal ballad sample really showed off the 'de‑expansion' side of Syrah. The sample is the end of the song, which goes from a repeat chorus with vocal, full orchestra and rhythm section to vocal and sustained strings getting quieter and quieter. The combination of compression to contain the loud sounds and de‑expansion to lift out the quiet sounds worked really well, and the display let me see this at work, both with the waveform and, even more clearly, with the Envelope metering underneath the waveform. Again the sound of Syrah did not disappoint. I found it able to increase the loudness without giving the sense that all the life had been squeezed out of the track. Syrah offers plenty of new ideas in dynamics processing. The highlights for me are the M/S option and the Bass Relax controls, and — once you get used to them — the metering and waveform display provide an interesting new way of showing the user what is going on. It's a shame that the poor manual doesn't make this easier. It's also a pity that, unlike other Flux plug‑ins, Syrah is not available in a TDM version. All in all, though, Syrah is a stunning‑sounding plug‑in that did not disappoint with any type of material I could throw at it. Very effective for loudness enhancement. Helpful waveform and metering display. Stunning price, given the features and sound quality on offer. It takes a while to get used to, which is not helped by a poor manual. 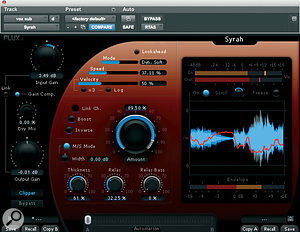 Syrah is an innovative and very effective dynamics processor. Once you've learned how to use it, the possibilities go well beyond what conventional compressors are capable of. AudioSage +1 323 528 4200. Apple Mac Pro with 2x 2.8GHz quad‑core Intel Xeon processors and 6GB RAM, running Mac OS 10.5.8, plus Digidesign HD2 system running Pro Tools 8.0.1.